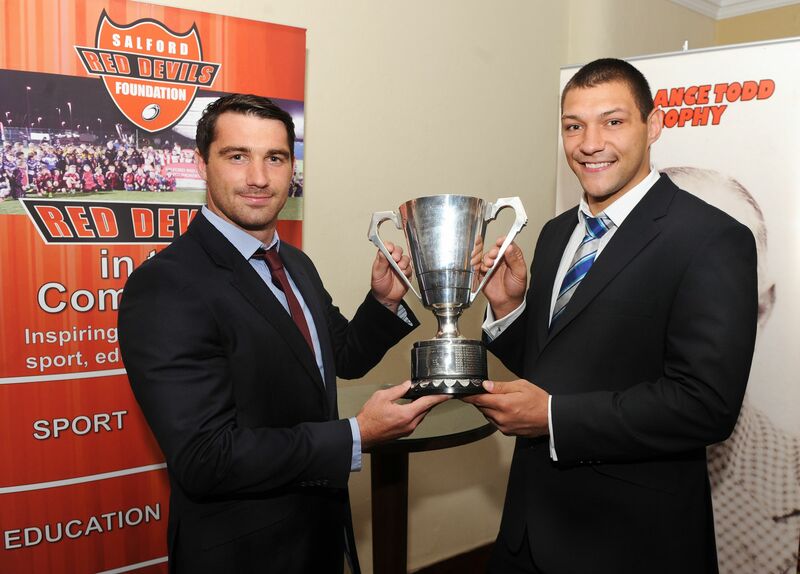 Wednesday evening saw one of Leeds Rhinos’ Challenge Cup conquering team join an elite band of men to lift the coveted Lance Todd Trophy. Double try scoring winger Ryan Hall came out on top in the man of the match stakes at Saturday’s Final, where the Rhinos triumphed 23-10 over Castleford Tigers. Hall joins a group of stellar names in holding the trophy including 3 times winner Sean Long, double winner Andy Gregory and his own captain Kevin Sinfield. Always presented at a ceremony on the Wednesday immediately after the Final, this year’s event played out in front of a packed audience at the Worsley Park Marriott in Salford. The ceremony that sees Hall inducted was hosted by Salford Red Devils Foundation, in conjunction with Rugby League Cares and One Medical Group. After overseeing proceedings at Wembley on Saturday, BBC rugby league commentator Dave Woods was MC for the evening and he was joined in the room by a host of ex winners, including Alex Murphy and Ray Ashby from the 1960s, right up to last year’s winner Matty Smith. Owned by the Red Devils Association, the Lance Todd Trophy has been awarded to the man of the match in the Challenge Cup Final every year since 1946. The New Zealand international player went on to play for Wigan and Dewsbury, before overseeing the most successful period in the Salford club’s history, which included its only Wembley win in 1938. Tragically he was killed in a motor accident during the Second World War and the award was born as a tribute to his life and successes.